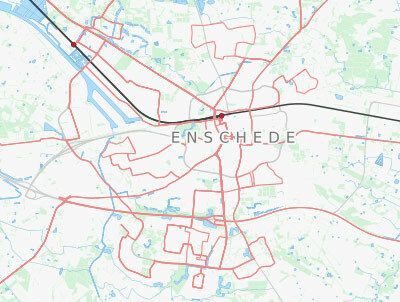 Enschede has a good network of local transportation that brings you quickly to all corners of the city. The buses are maintained by Twents and drive on an regular schedule from early in the morning till midnight. You can also travel to a few destinations such as Glanerbrug, The University or the FC Twente Stadium by train. Even the nearby German city of Gronau takes just 10 minutes by train. Beside bus and train there are a couple of taxi companies to bring you from door to door. Local transportation network in Enschede.